Donna Johnson grew up in a dysfunctional environment with frequent moves, betrayal by family members, and a regular exposure to religious practices that she did not understand. This book seems to serve a dual purpose in showing the dark side of an aberrant form of Pentecostalism (certainly not a reflection of mainstream Pentecostal practices) and a form of catharsis to try to sort out and deal with a lot of confusion and conflict in her own life. The end product is a poignant and compelling story of one young woman’s still ongoing journey. When she was three years old, Ms. Johnson’s mother joined a tent evangelist ministry led by Daniel Terrell, playing the organ. Over time, her mother had an affair with Terrell, married him, and was later divorced when he became involved with other women. At one point during this period, Terrell was indicted for federal income tax fraud and spent several years in prison. The Pentecostal movement in the United States had its beginning with the Azusa Street revival of 1906 in Los Angeles, California. This new movement was characterized by passionate and exuberant preaching, physical and spiritual healing, and the practice of speaking in tongues (glossolalia). Although the major Pentecostal groups such as the Assemblies of God and the International Church of the Foursquare Gospel (founded by the controversial Aimee Semple McPherson) soon established structure and systems of accountability, “freelance” evangelists like Terrell traveled the country holding tent meetings and revivals. These ministers generally operated outside the purview of the denomination that they may or may not have been affiliated with. This was the situation with Terrell. Ms. Johnson’s early years were spent in frequent moves (mainly through the South) as Terrell’s group would move from place to place, setting up their tent and holding lengthy (often months-long) meetings, with preaching services usually at least twice a day. Although local pastors were often invited to sit on the stage with Terrell, they usually had little real involvement with the ministry, and certainly exercised minimal (if any) oversight of finances or any other aspect of the ministry. At first her mother mainly played the organ and assisted with setup and takedown of the tents and equipment. But after a few years, Ms. Johnson began to sense a change in her mother’s relationship to Terrell, who was married at the time. Eventually she realized that her mother and Terrell were involved in ways that were “not right” (initially she was too young to be really aware of the details of adultery). Her mother would leave her and the other children with other families for months at a time while going off with Terrell on his evangelistic trips. As Ms. Johnson’s biological father had left when she was two (he was having an affair at the time), these later temporary abandonments by her mother were especially painful. Living in a very strict environment (dress was very conservative, and such things as television were expressly forbidden), Ms. Johnson and her siblings felt very alienated from the society around them. In addition, the frequent moving and inability to develop close and lasting friendships with children her age created a sense of emotional distance from others that she has spent years trying to overcome. The final break came when Terrell was found guilty of federal tax evasion in the late 1970s. He had gone from a poor, struggling itinerant preacher to a man who drove expensive cars and had several luxurious homes. Terrell spent several years in prison, apparently a model inmate who continued to function informally as a pastor to other inmates while he served his time. After his release in 1987, he went back to revival preaching and is still active, according to his website. Ms. Johnson finally broke with her family as a teenager and lived for several years in a number of chaotic and self-destructive relationships. At the end of the book, she and her husband return to Texas for the funeral of Terrell’s son. The closing scene is especially touching as she and Terrell meet after so many years of estrangement. You get the sense that she has come to at least a partial reconciliation with the man who had caused her so much grief and pain in earlier years. The flaw in the system under which Terrell and others like him operated was a lack of accountability. He had sole control of all the money that came into the ministry—in contrast, Billy Graham has a board that makes all financial decisions and sets Graham’s salary. Terrell had no one who could call him to account with regard to his behavior, either. His activities with various women were known to many, but there was no one to play Nathan and say, “You are the one,” when Terrell was openly and flagrantly sinning. To his credit, Terrell did something that few other evangelists of his time did: He integrated his church services (Billy Graham held his first integrated meeting in Birmingham, Alabama, in 1964). Ms. Johnson describes the banner that hung over the entrance to the big tent. Included was the phrase “Everyone Welcome,” which was understood to mean “no segregation here.” Both blacks and whites intermingled in the tent and on the grounds. That behavior did not sit well with the local Ku Klux Klan, which came to visit one night in 1961 during the meeting. Her description of the tension that night clearly conveys the fear that both races had of the Klan. But Terrell stood his ground and never changed his practices. There are a couple of minor shortcomings in the book. Ms. Johnson attempts to describe a couple of episodes of glossolalia by including a few syllables that were supposed to represent what she heard. Unlike the stuttering monosyllabic phrase she offers us, real glossolalia is a rich, flowing sound. In another section of the book, she describes how some well-meaning (but misinformed) church members tried to get her to repeat nonsense syllables so she could “learn” to speak in tongues. The gift is not “learned’ and does not come by practice, as Ms. Johnson indicates she is aware. As with the other gifts of the Spirit, it is just that: a gift. The other frustration comes with the lack of dates. Including years that events took place would have been very helpful to put her experiences in the context of events around her. During the late 1960s and into the 1970s, another significant move of the Holy Spirit was taking place in the charismatic renewal movement. Unlike the previous Pentecostal outpouring, the charismatic renewal encompassed both independent groups and mainstream churches, both Catholic and Protestant. Being able see how Terrell’s activities overlapped these other events would have been helpful in developing a continuity of history. David Terrell was (and is) an enigma. He was a powerful preacher, someone who apparently had the gift of healing based on the testimonies of many who attended his tent meetings, and yet he was also dishonest and flagrantly immoral. He touched the lives of thousands and managed to damage almost very personal relationship that he entered into. Ms. Johnson struggles with these contradictions and never fully resolves them. What she leaves us with is a picture of a man who knew both good and evil and of a girl whose life was both challenged and damaged by his involvement in her life. Is life ever simple enough to resolve complexities like these, involving real people, into black and white boxes? 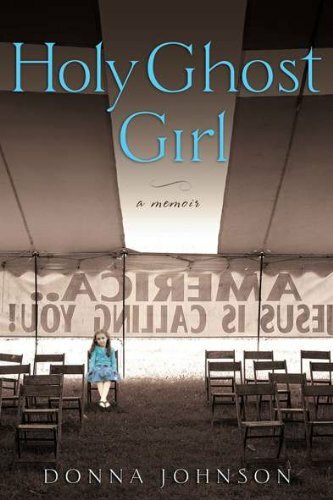 Regardless, it is clear, as stated on her biography page, that Ms. Johnson’s healing is still in process and that Holy Ghost Girl: A Memoir is an important and interesting part of that complicated journey.